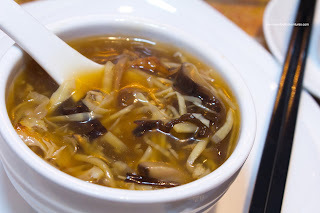 Rather than ordering from their set menu, we went ahead with random items starting with the Duck & Dried Fish Maw Soup. 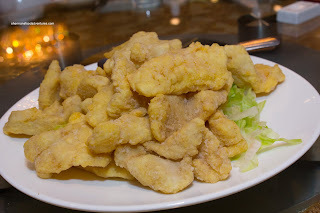 For those who are unfamiliar, fish maw is the fish air sac which has been either fried or dried. 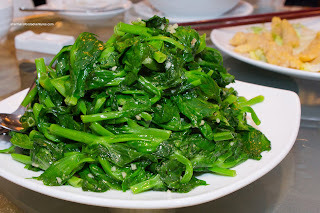 In this case, it was the dried variety which is more gelatinous and chewy compared to the airy and spongy fried type. In addition to the duck and fish maw, the soup consisted of wood ear mushroom, shiitake, bamboo shoots and ginger. Although conservatively seasoned, we felt the soup base had enough depth to provide flavour. Furthermore, the soup was not overthickened with starch, so it silky rather than goopy. For our first dish after the soup, we had the Fried Fish with Cream of Corn Sauce. If you are wondering where the sauce disappeared to, we actually asked for it to be served on the side. This way, the fish doesn't become a soggy mess. As illustrated in the picture, the amount of fish on the plate was substantial. It was prepared so that it was still moist and flaky while the outside was slig htly crisp. It wasn't as crisp as we would've liked, yet at the same time, we appreciated the very thin layer of batter which meant more fish. As for the corn sauce, it was pretty standard since it does come from a can (albeit diluted, seasoned and starch-thickened). When the Stir-fried Pea Shoots arrived, we were in awe. That had to be one of the largest mounds of peas shoots we've ever seen in a restaurant. This could've easily be split into 2 separate orders. Now portion size is one thing, execution is another. 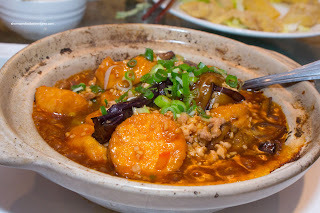 Thankfully, this fit the Chinese criteria of "peng yau leng" which means inexpensive while still good. The pea shoots were tender with a slight crunch, although a tad greasy. It was modestly seasoned with a hint of garlic. We would've liked to see more salt in this dish. With the kiddies present, we had to get a dish that they would eat. On cue, we got the Scrambled Eggs and Shrimp. 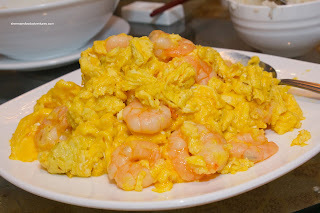 This was once again a large plate of food consisting of fluffy eggs and a surprising amount of large crunchy shrimp. We light how the eggs were cooked just right without being greasy. My personal favourite of the night had to be the Spicy Eggplant and Tofu Hot Pot. For me, the star of this dish had to be the fried silken tofu. It was soft and sweet. Although the garlicky meat sauce was on the sweeter side, I still enjoyed it, especially with rice. The eggplant could've stood to be cooked a little less since it was hard to pick up with our chopsticks without disintegrating. 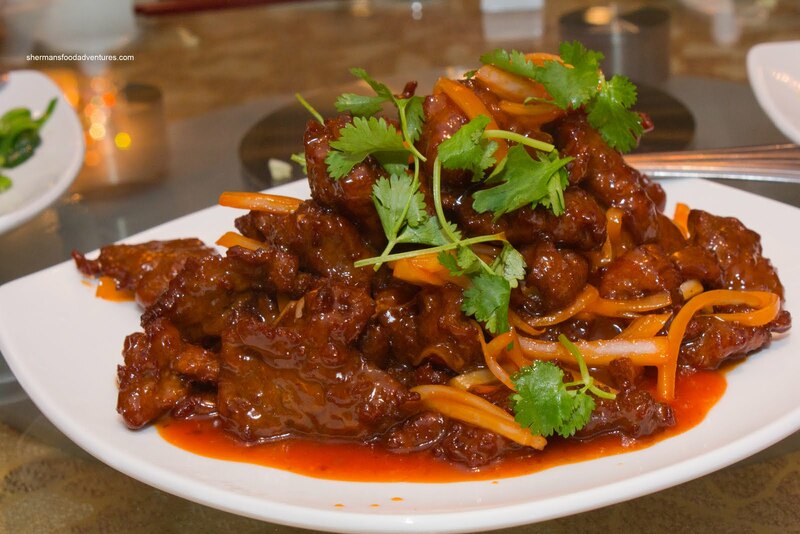 Our last dish was was the Chinese-style Beef Tenderloin. Now, for those who don't know, this dish is rarely made with actual tenderloin. Rather it usually consists of beef that has been tenderized (usually a combination of pounding and baking soda). This one could've been tenderized a bit more since it was on the chewier side. Furthermore, the pieces of beef were far too small. Convenient to eat, yet it results in a drier product. The sauce was good though, it was tangy with a hint of depth provided by Worcestershire sauce. 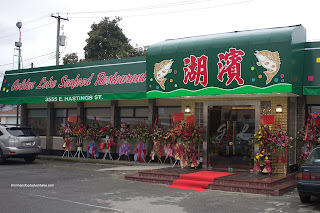 Despite the last dish, the meal as a whole was above-average at reasonable prices. The portion size here is mind-boggling. With the recent renovations and attentive staff, I think Golden Lake is a solid choice for authentic Cantonese food in the area.